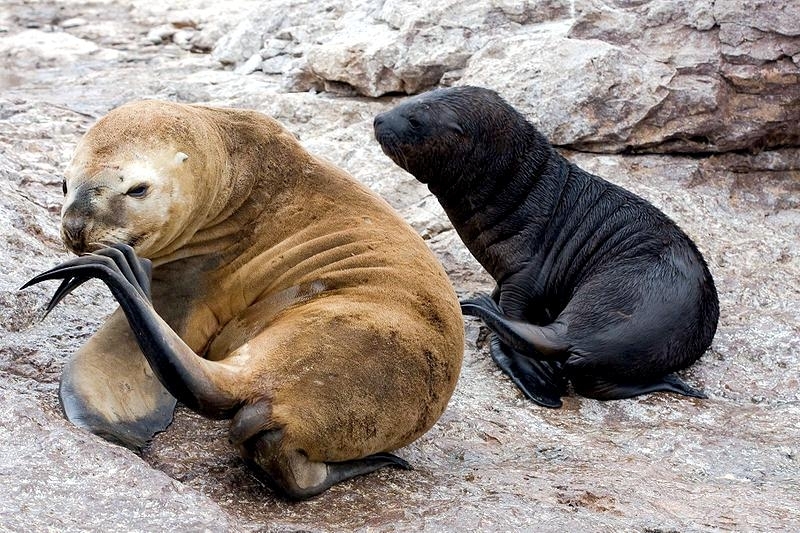 Southern Sea Lions are also called the South American Sea Lion and the Patagonian Sea Lion and vary in size within the species and between males & females. 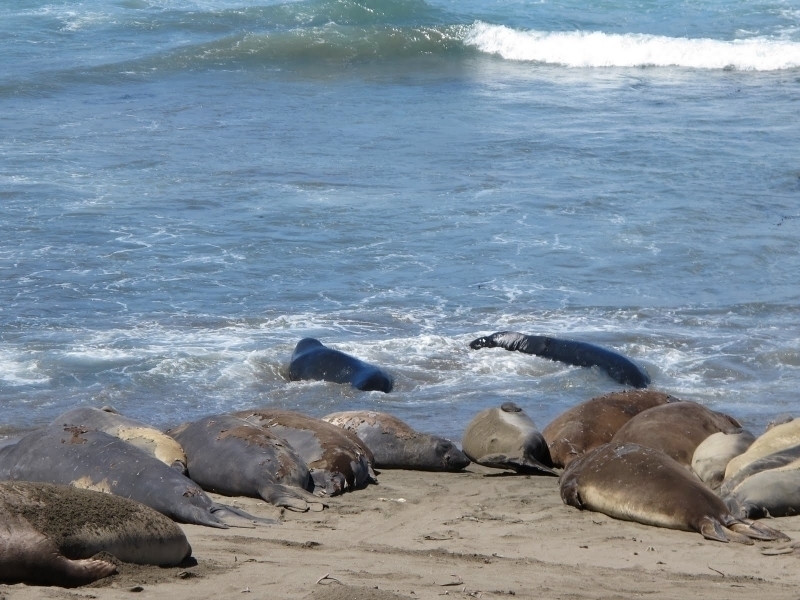 Adult males measure an average of 2.6 meters long and weigh around 300 kilograms, while adult females measure an average of 1.8-2 meters long and weigh around 150 kilograms. 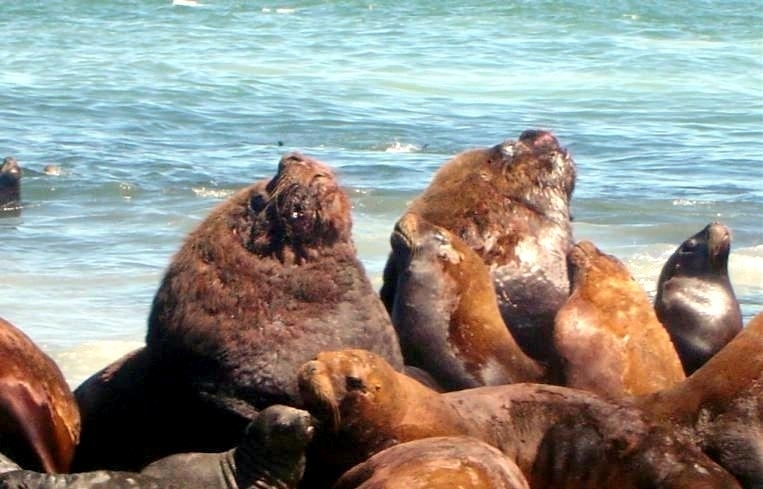 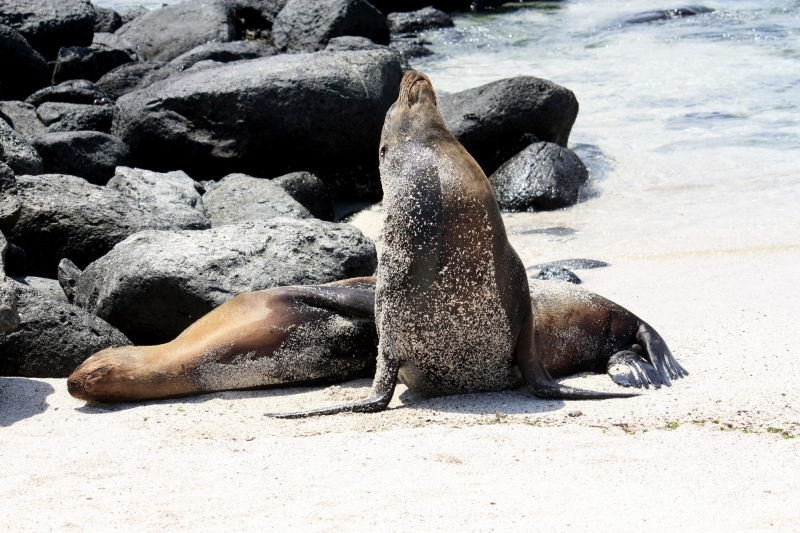 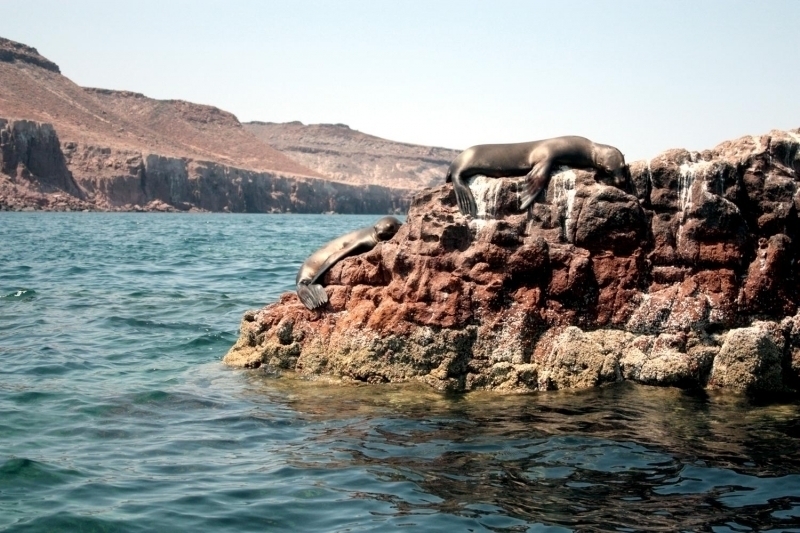 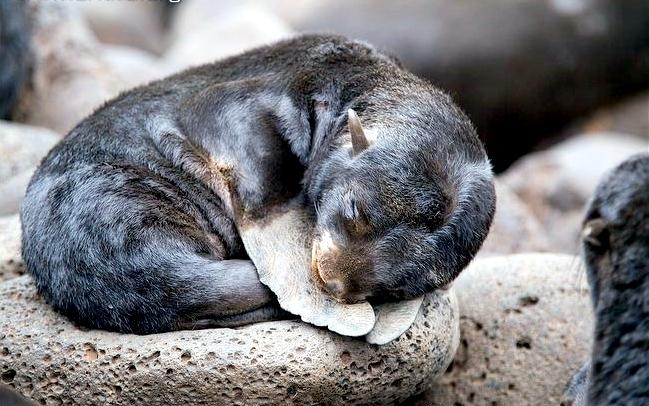 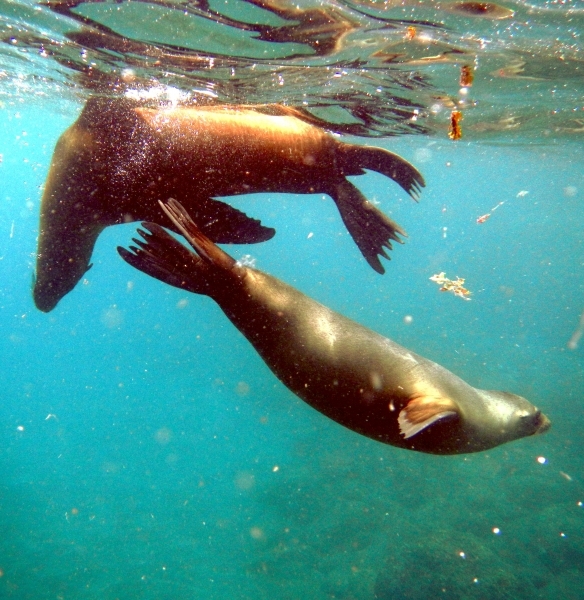 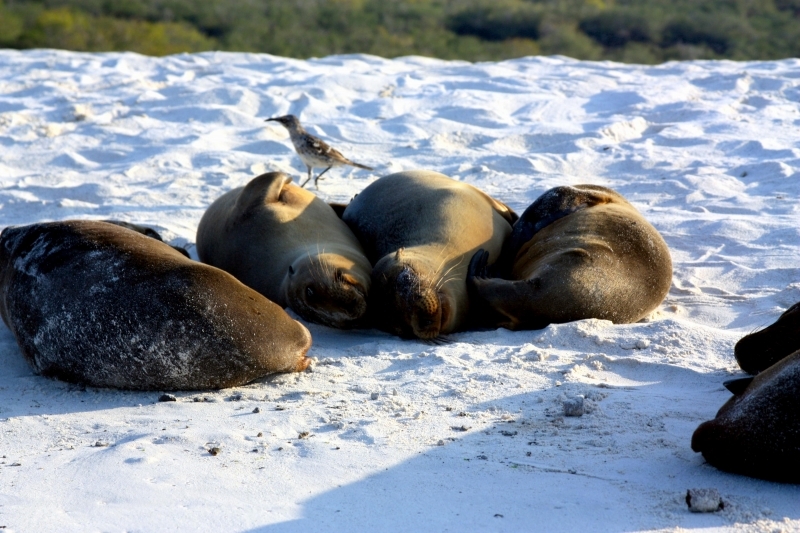 Adults Southern Sea Lions have dark brown backs and light brown chests. 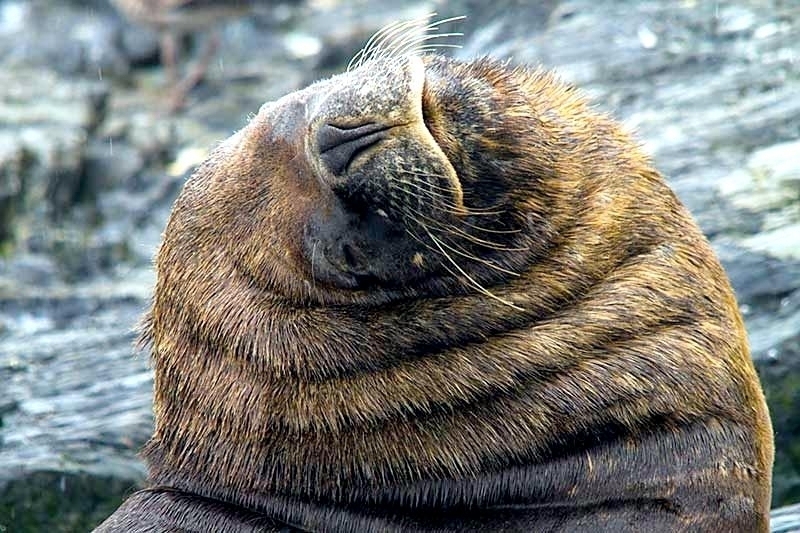 The manes on males are lighter than females & female’s fur on their heads and necks is lighter than that of males. 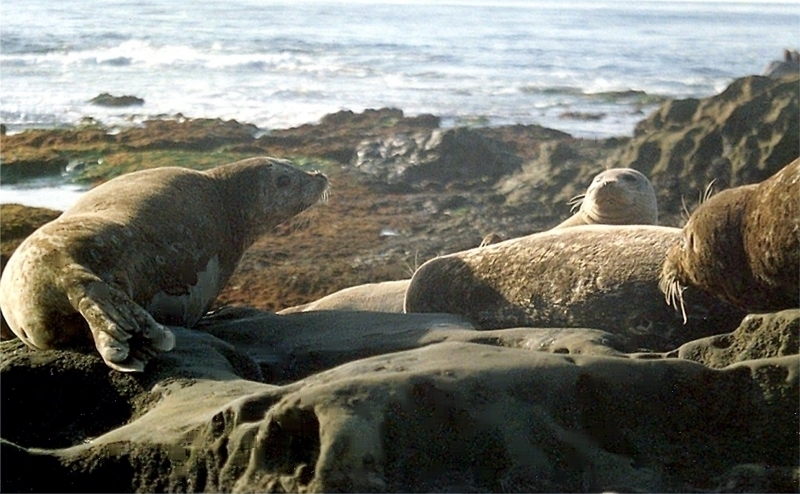 The males have massive heads and necks with a characteristically upturned nose. 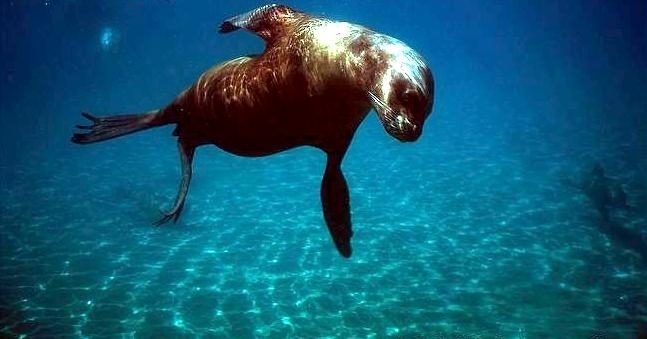 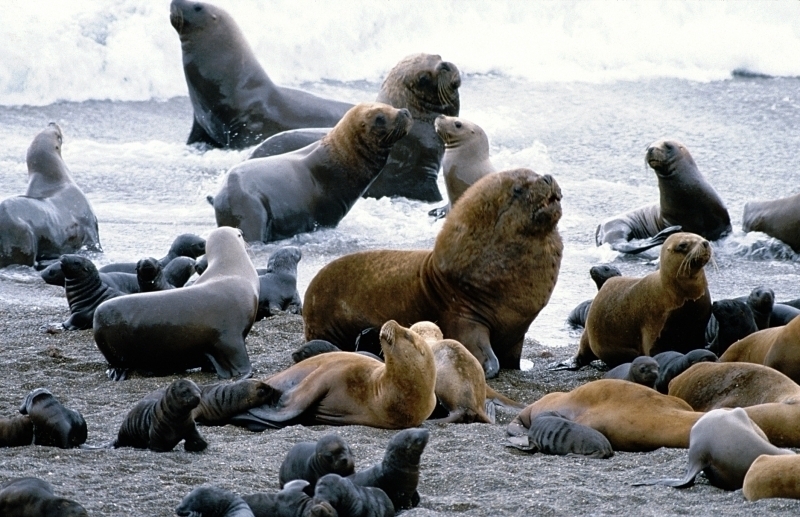 Southern Sea Lions live on an average for about 20 years. 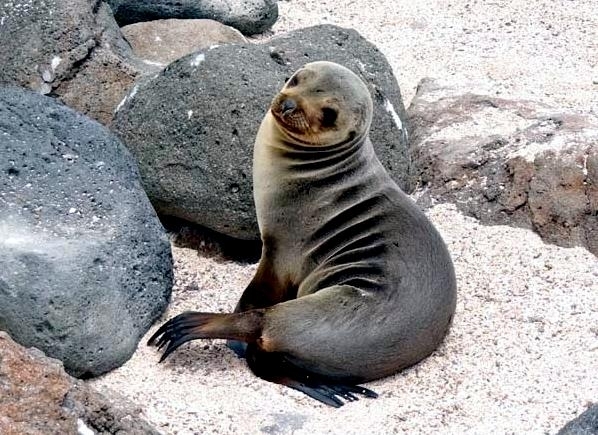 They are found along the coasts and off-shore islands of South America from Zorritos in northern Peru to Ilha dos Lobos in southern Brazil, although wandering individuals have been found as far north as Ecuador and the Galápagos Islands. 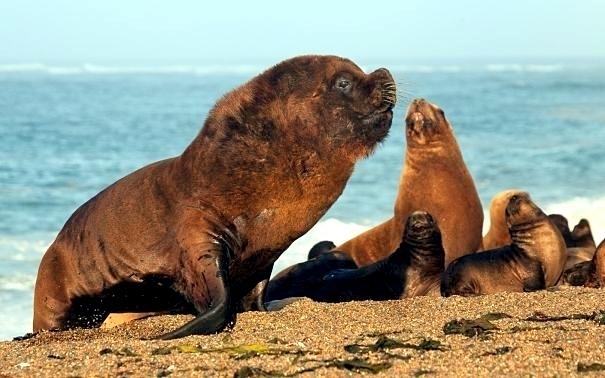 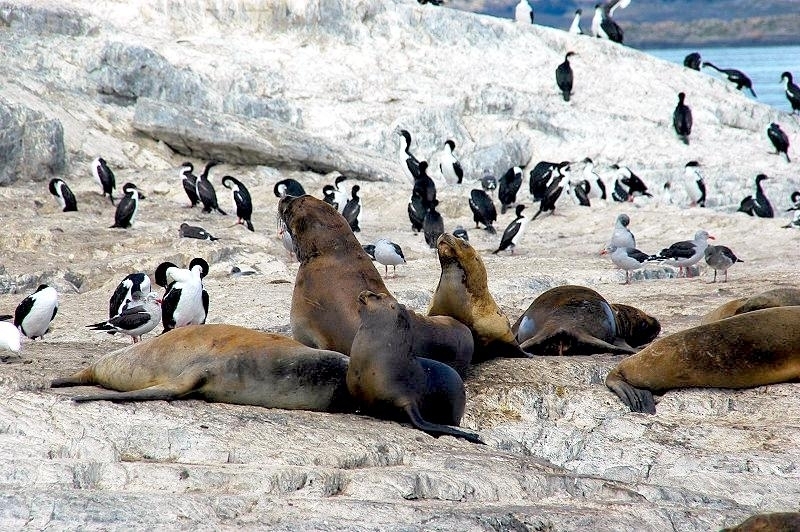 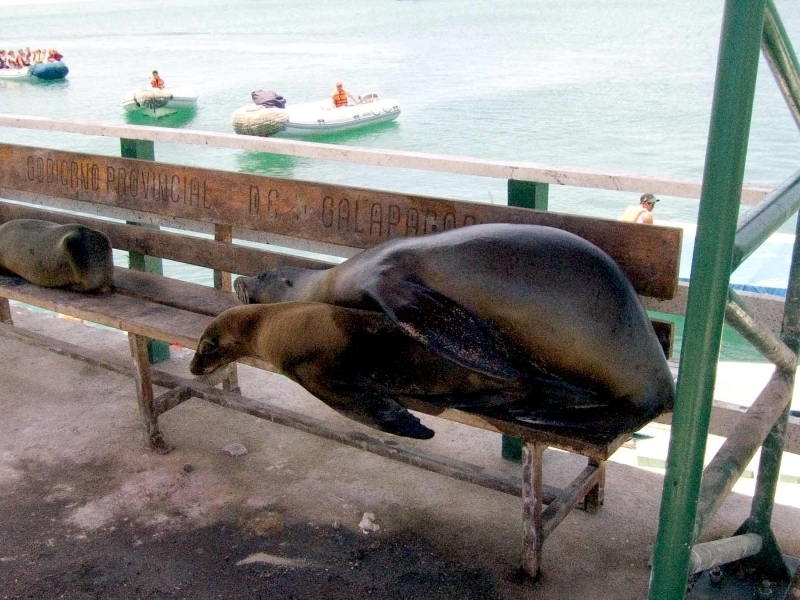 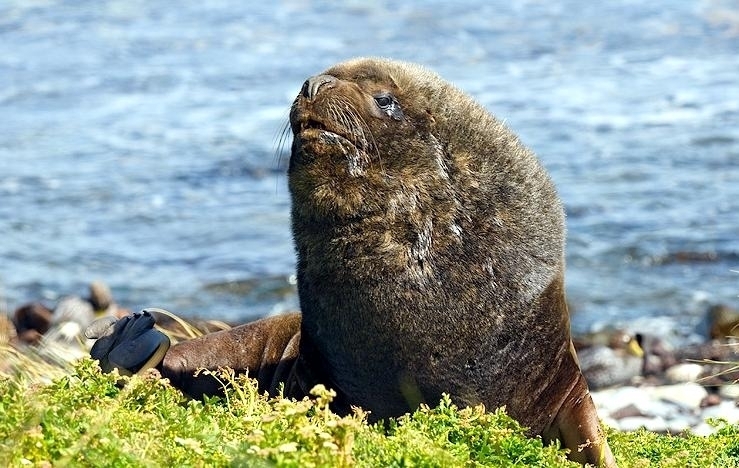 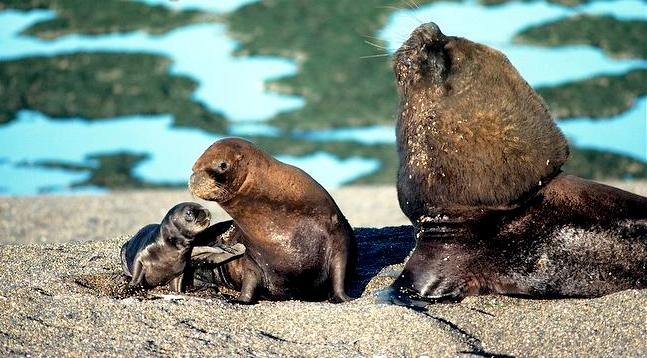 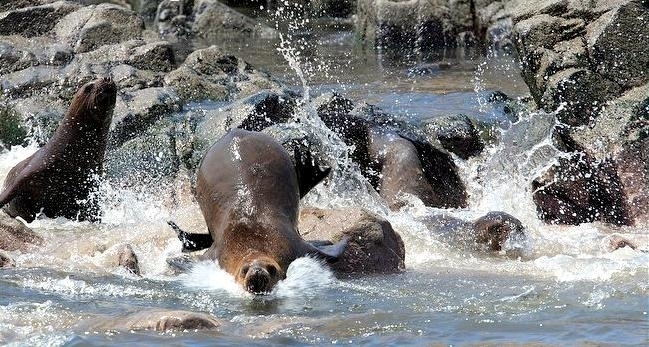 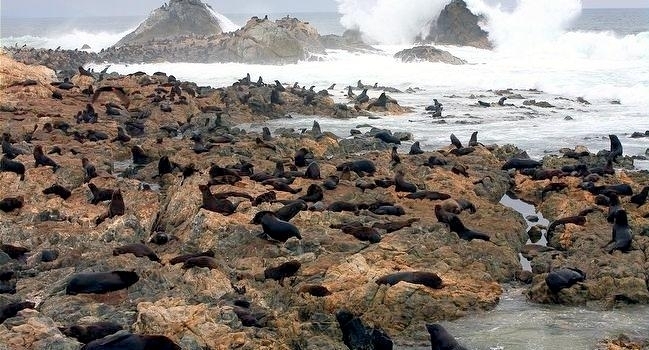 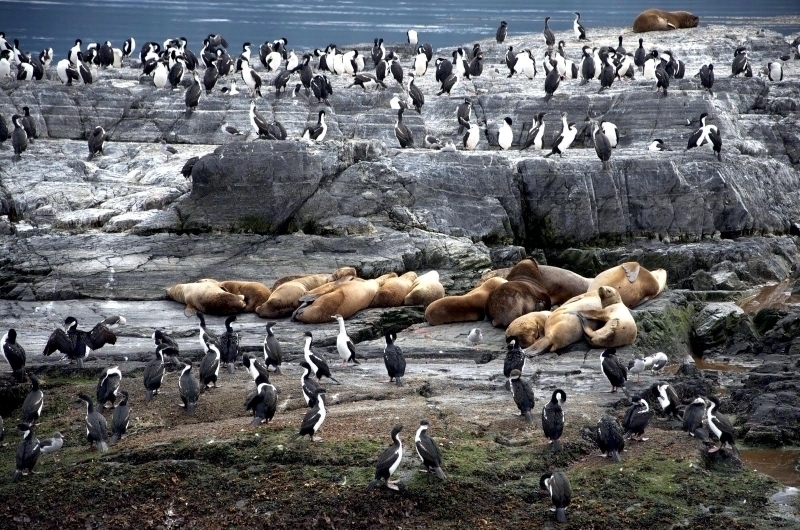 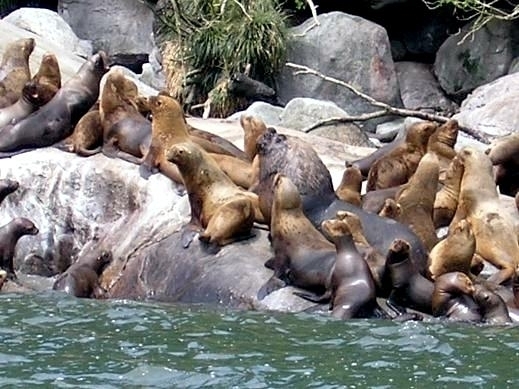 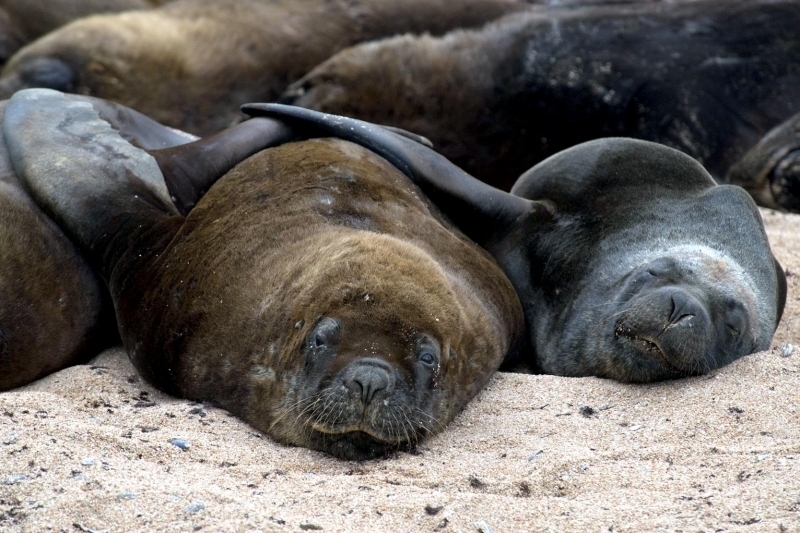 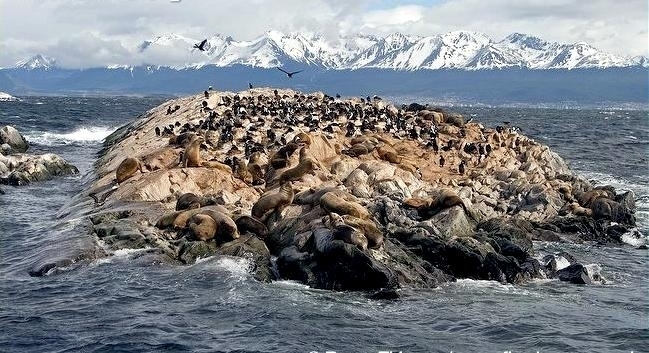 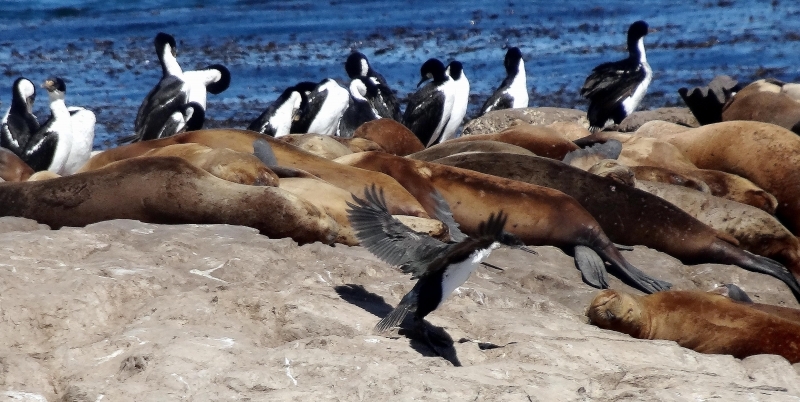 The total population of Southern Sea Lions is estimated at 265,000 with regional estimations of 30,000 in Peru, 128,500 in Chile, 90,000 in Argentina, 12,000-15,000 in Uruguay, 3,000 on the Falkland Islands and a few hundred in Brazil originating from the Uruguayan and Argentinean colonies. 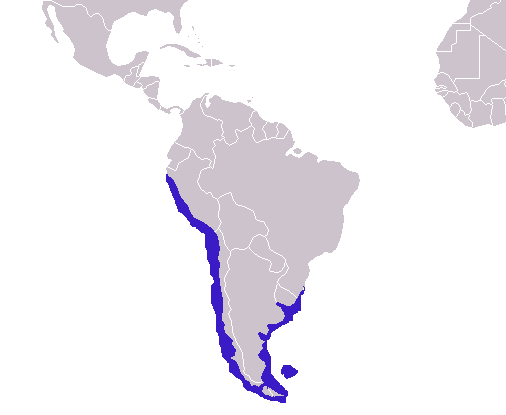 The populations in Uruguay and the Falkland Islands are decreasing while those in Argentina and Chile are increasing by 3% annually. 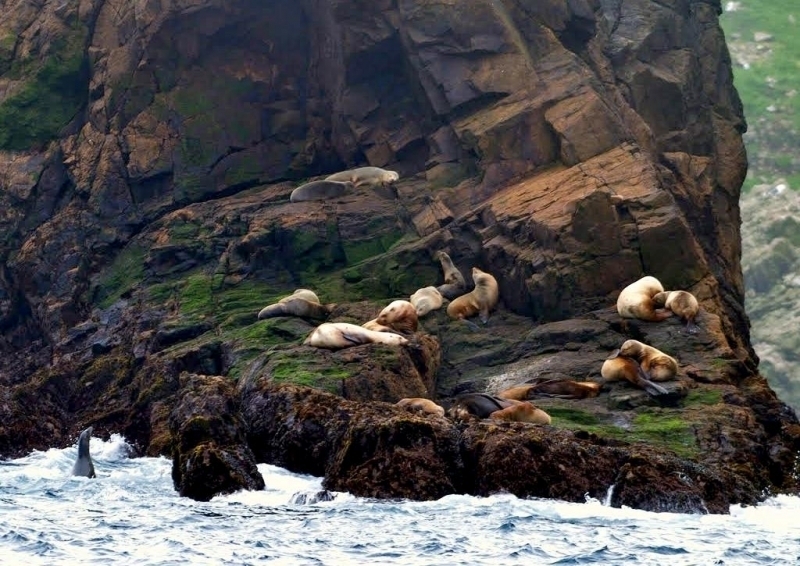 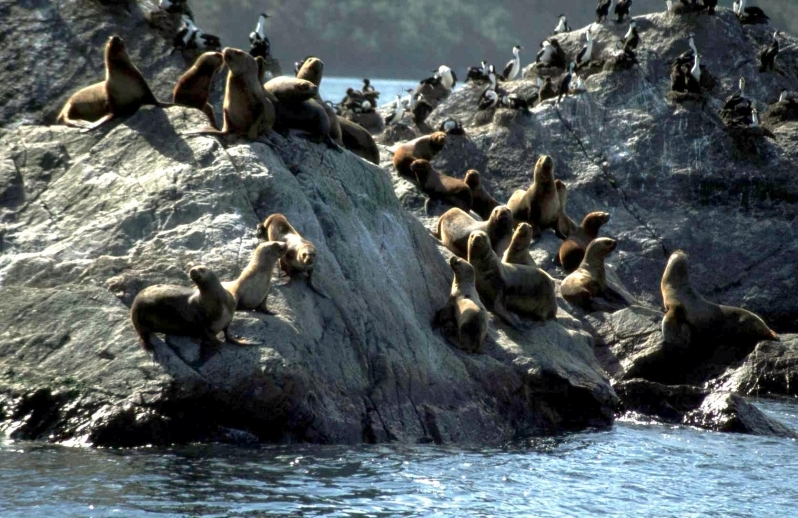 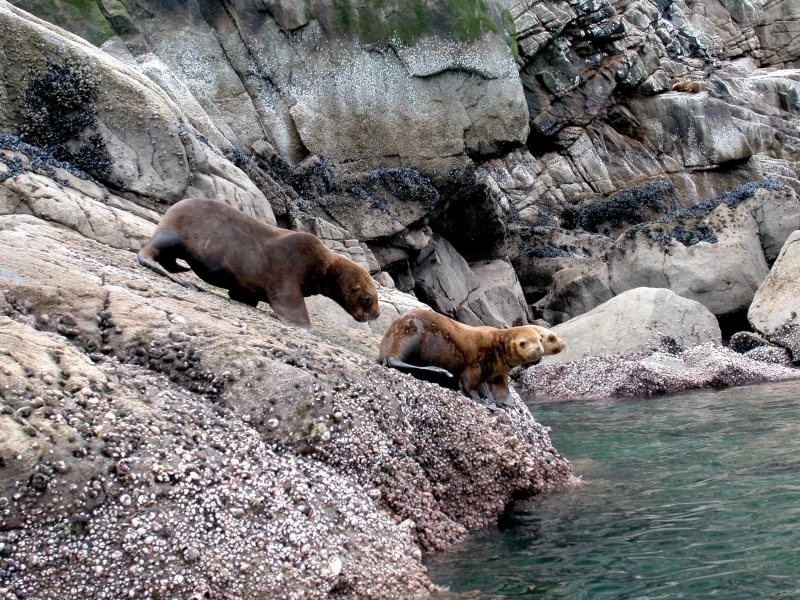 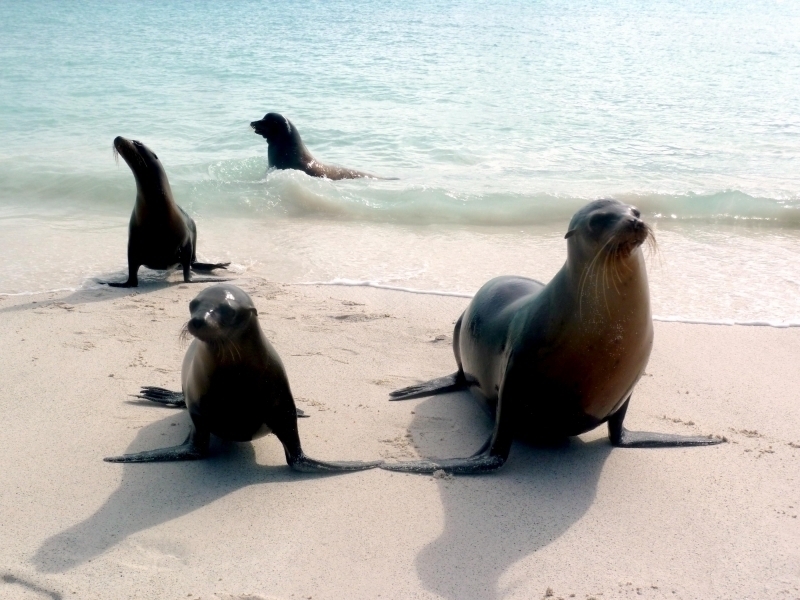 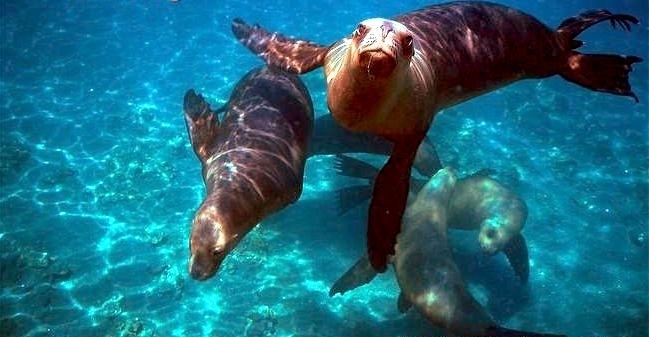 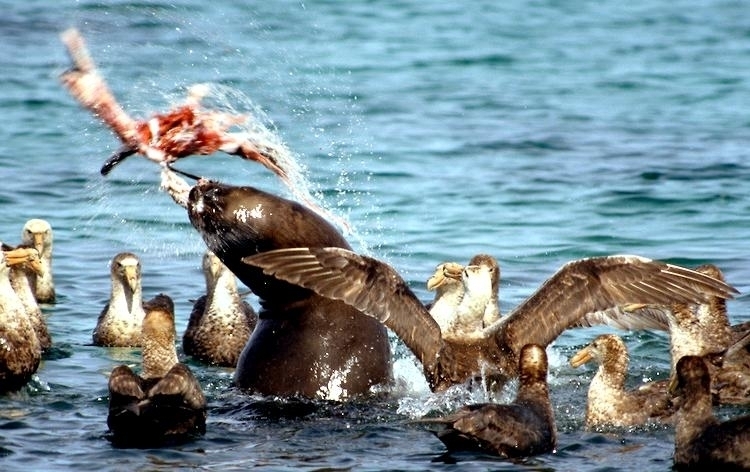 Southern Sea Lions are opportunistic feeders with a diet of many species including fish, cephalopods and crustaceans. 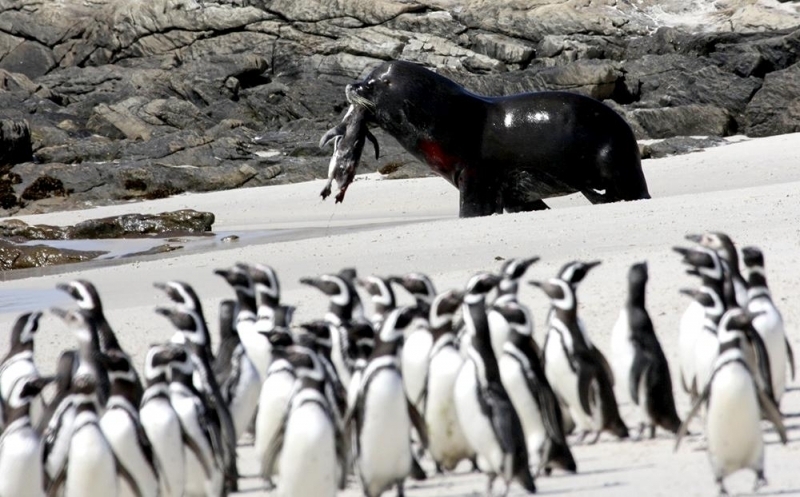 Females feed in coastal areas and on a larger variety of prey than the males. 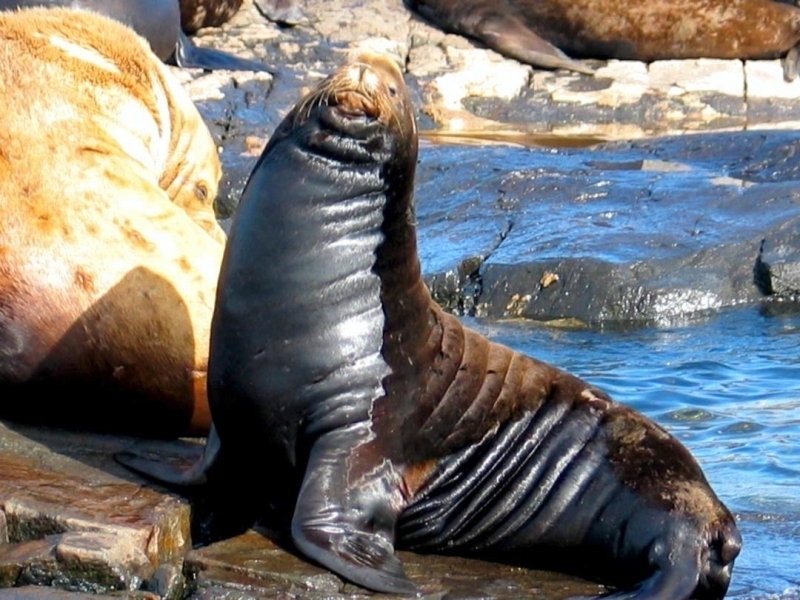 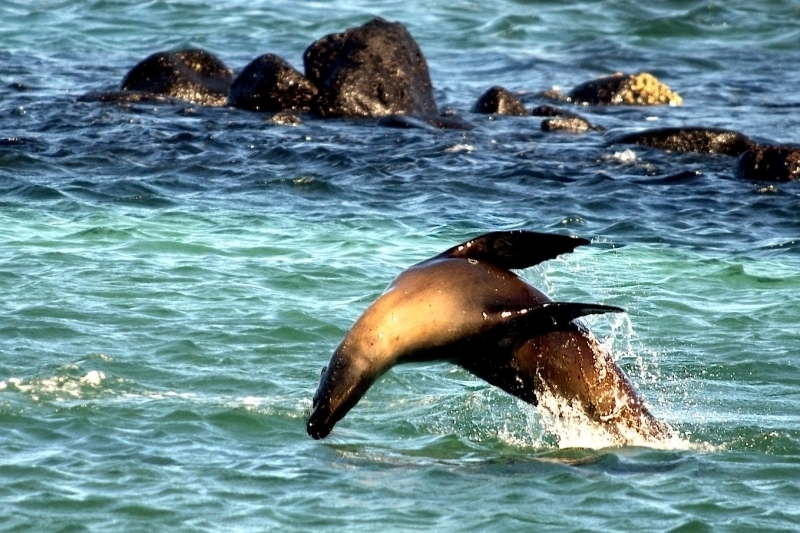 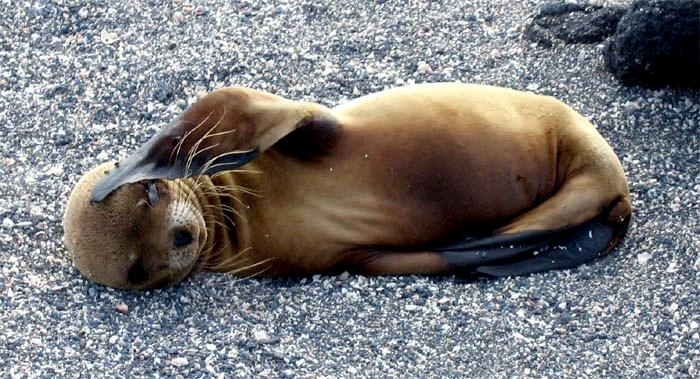 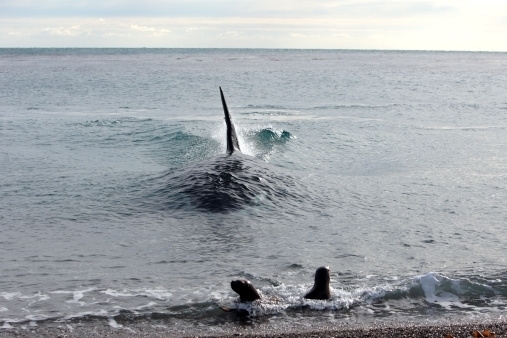 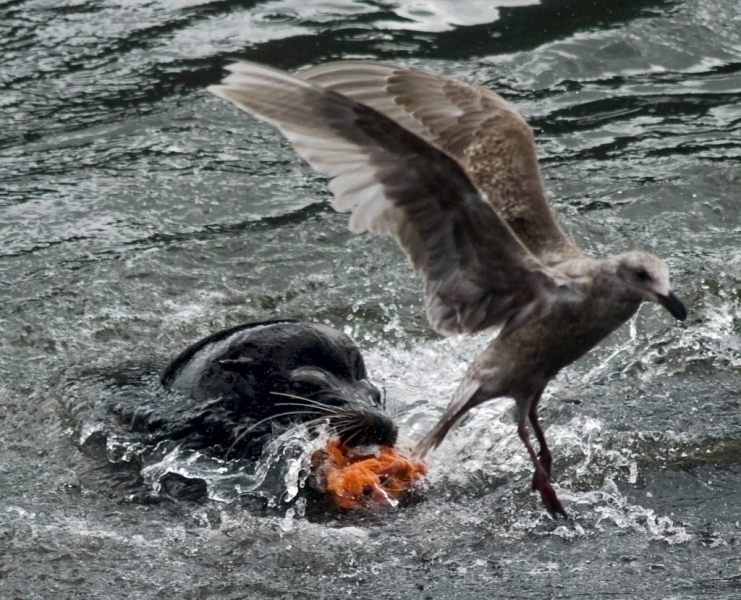 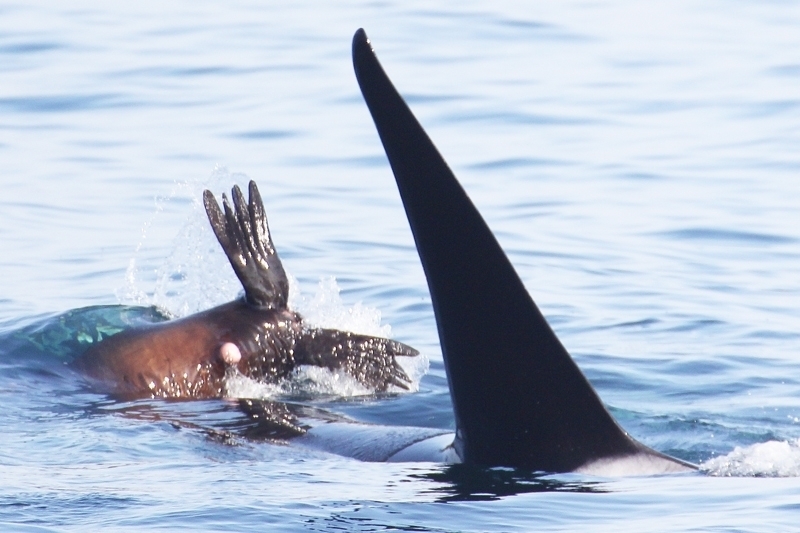 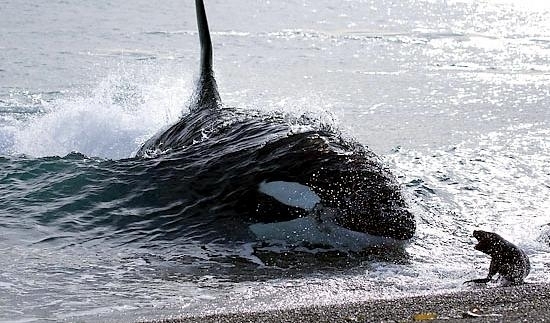 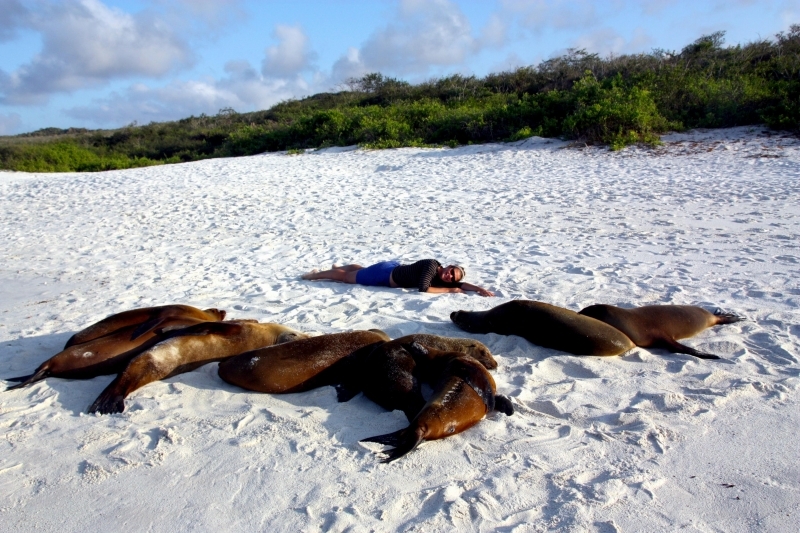 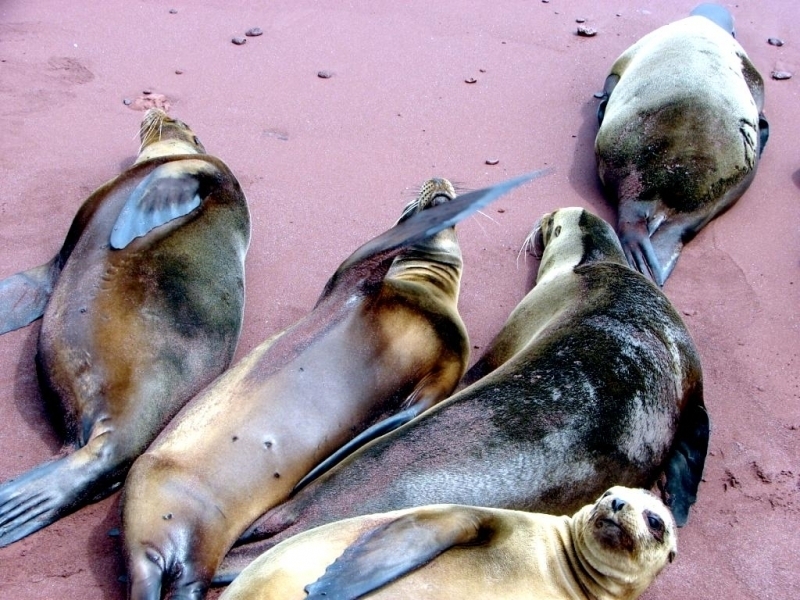 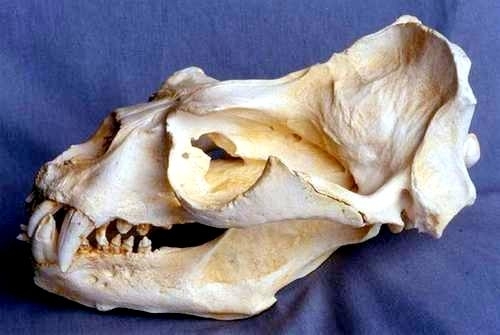 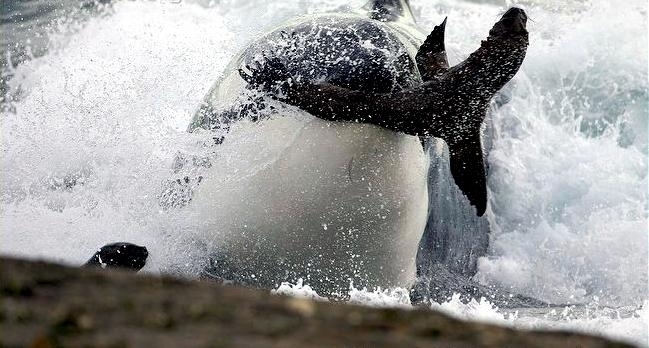 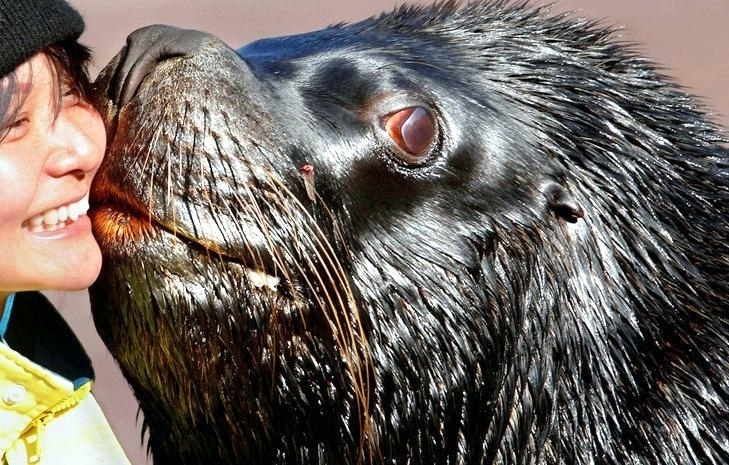 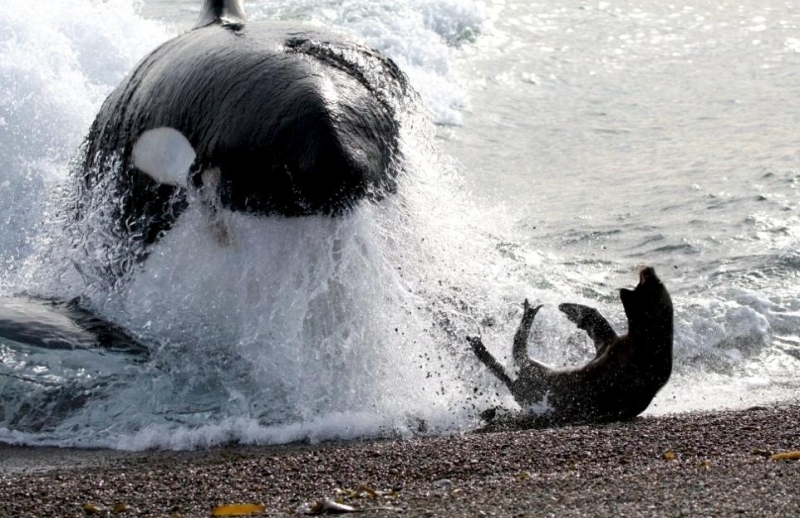 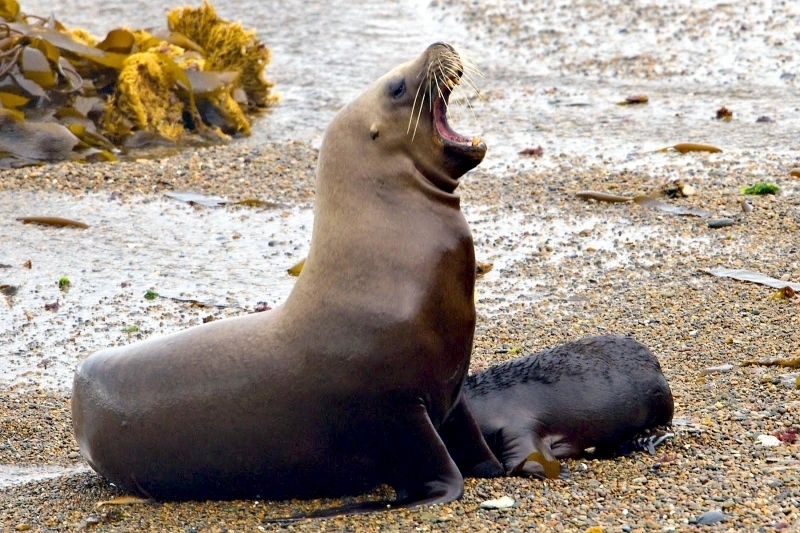 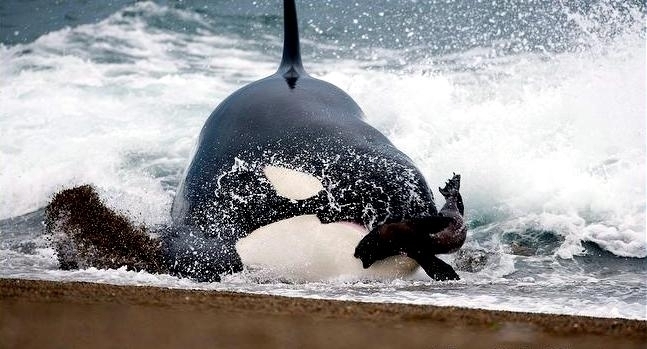 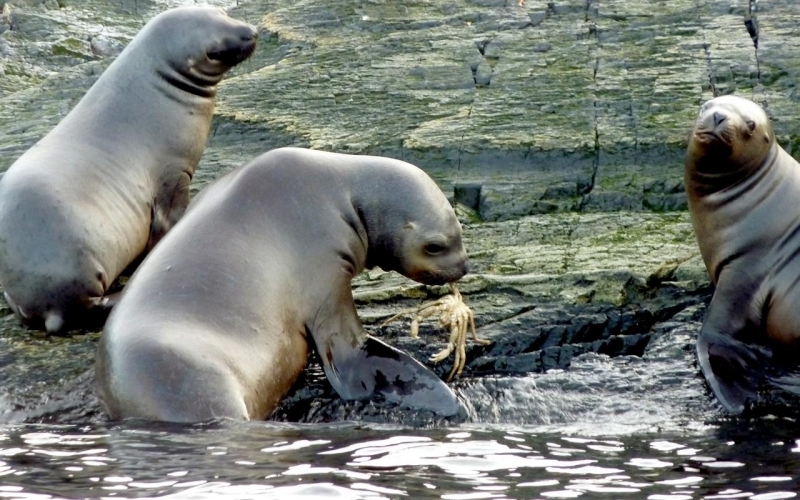 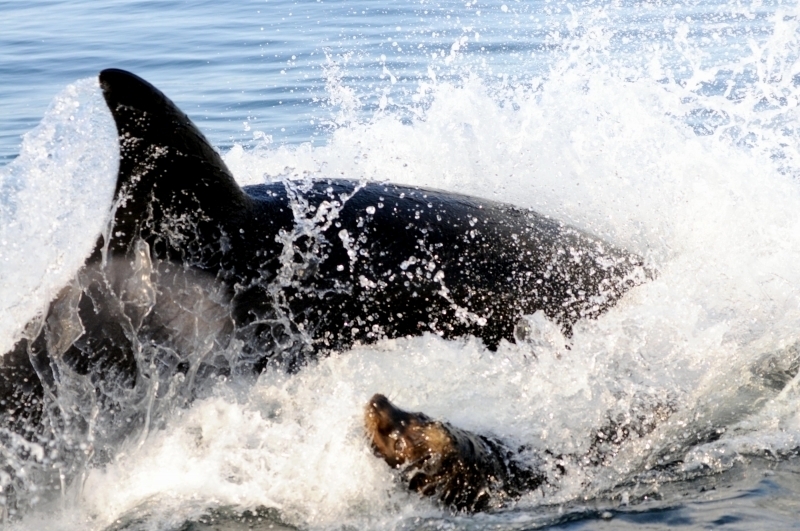 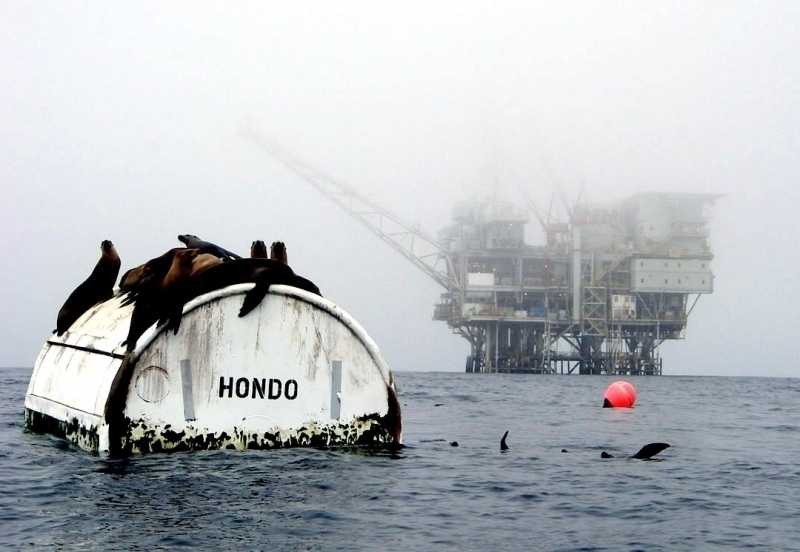 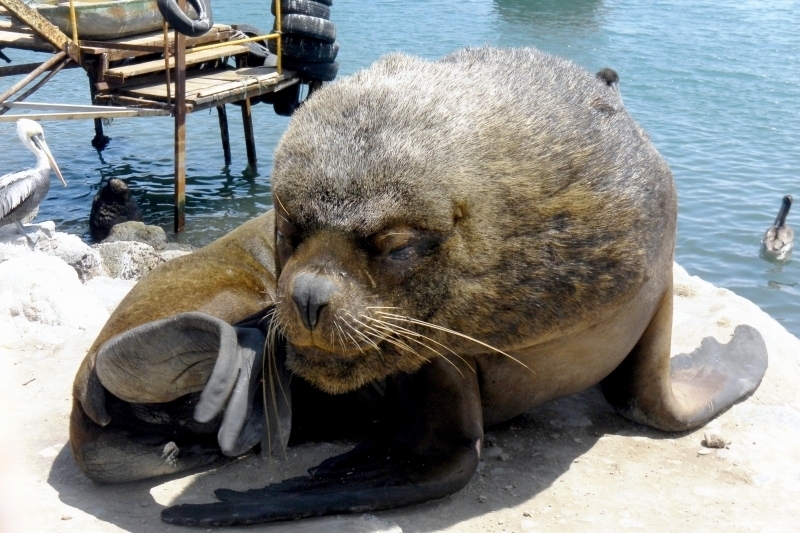 Southern Sea Lions are preyed on by sharks and Killer Whales. 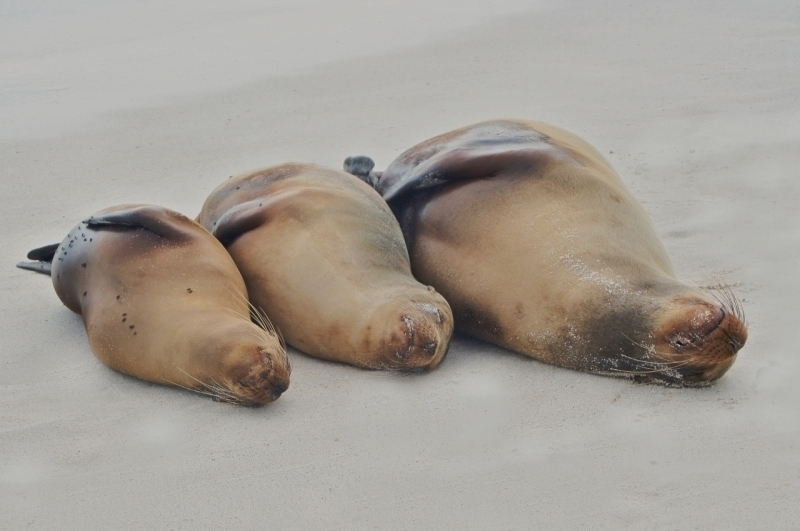 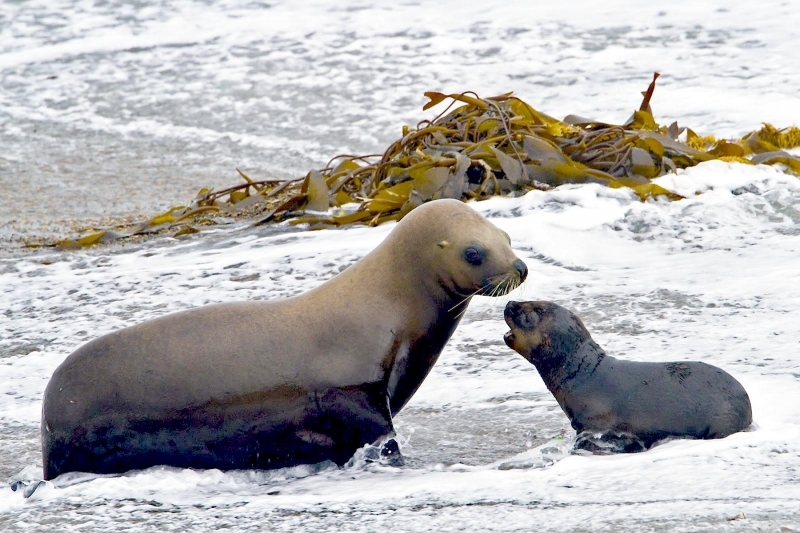 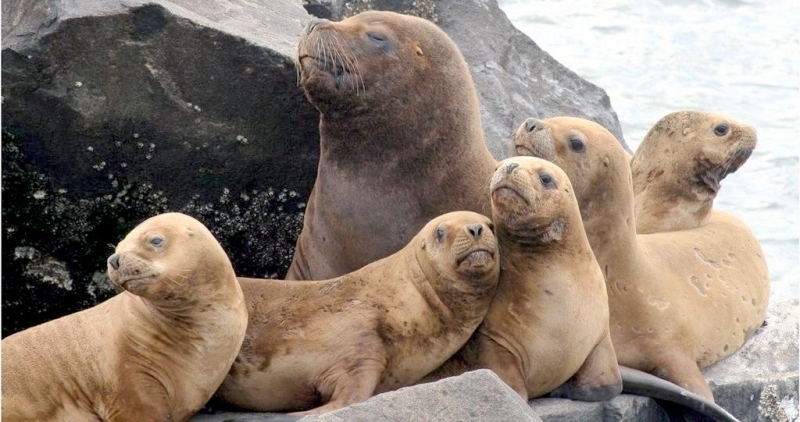 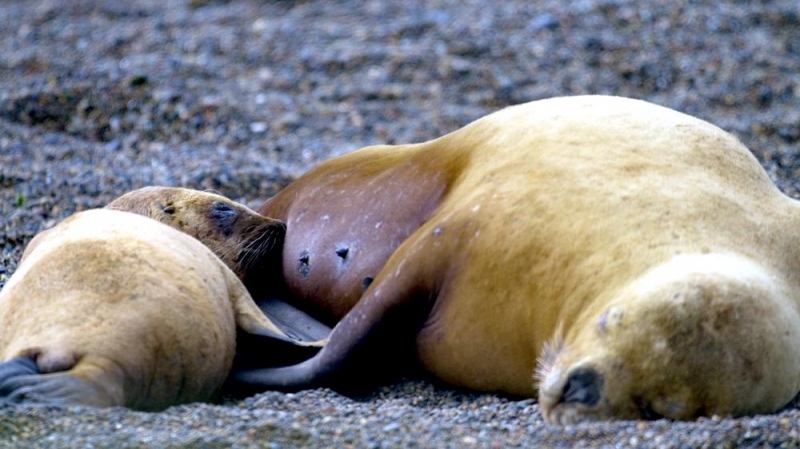 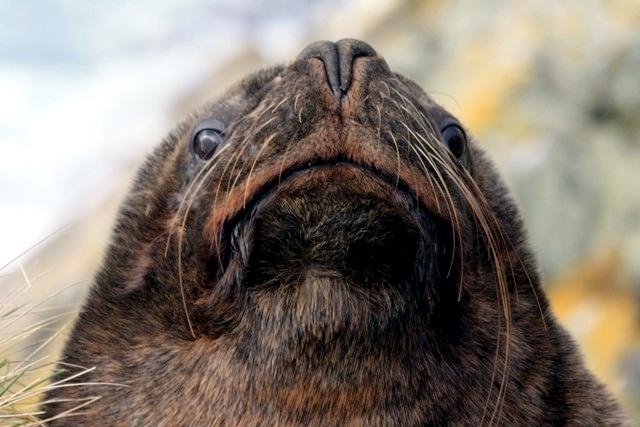 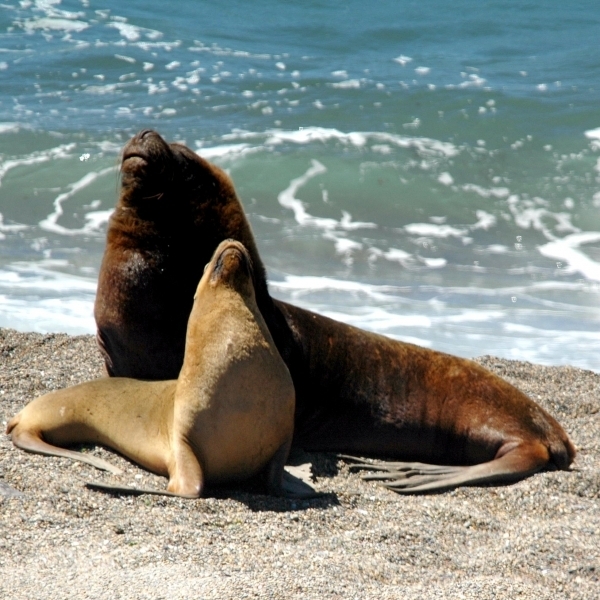 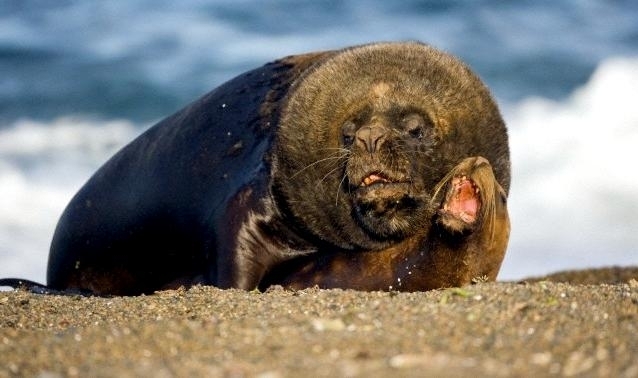 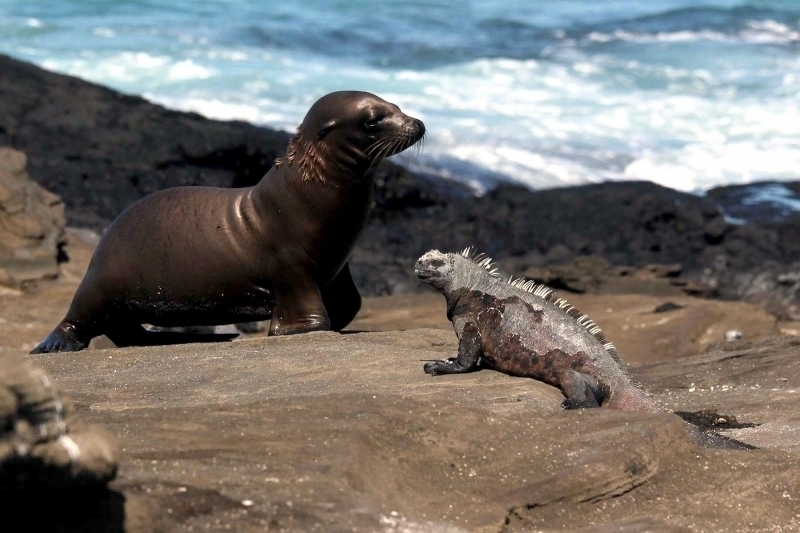 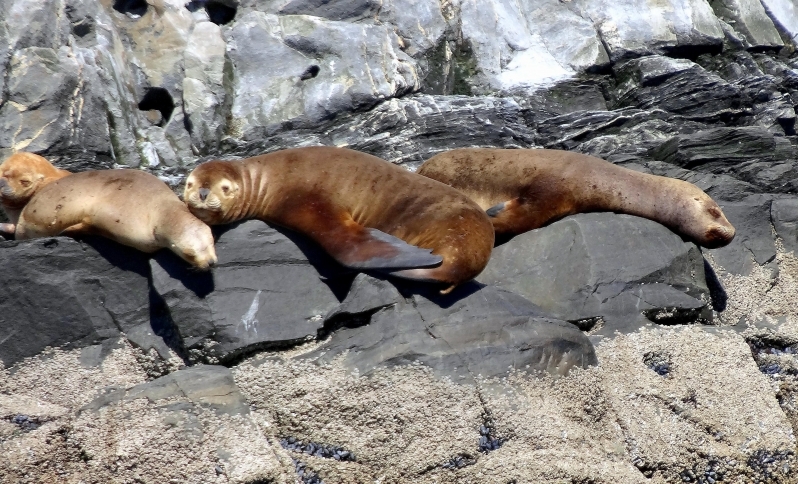 Female Southern Sea Lions reach sexual maturity at 4-6 years, males at 5-6 years, although males only first achieve territorial status at 9-10 years. 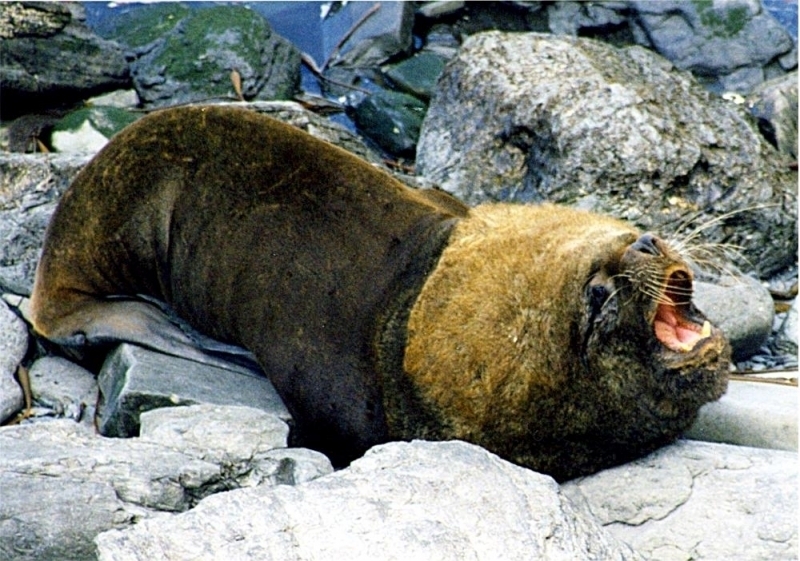 Males arrive at the breeding colonies before females in late November-early December to establish territories that will eventually contain an average of 3-6 females. 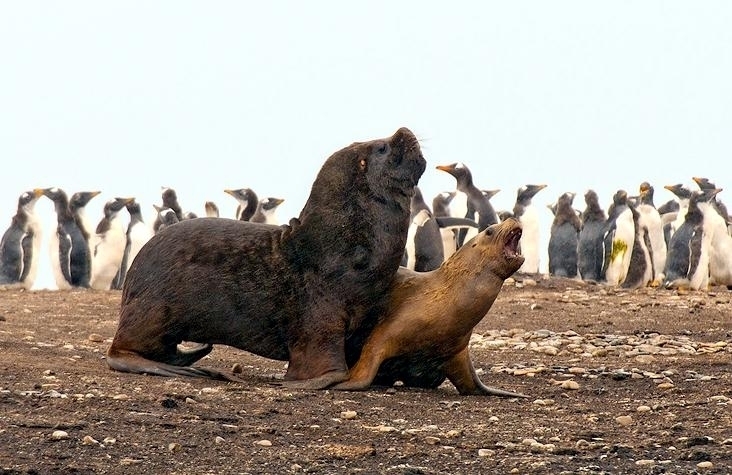 Less dominant males unable to establish territories are known to attack undefended females & pups, occasionally attempting to mount them and in some cases killing them in the process. 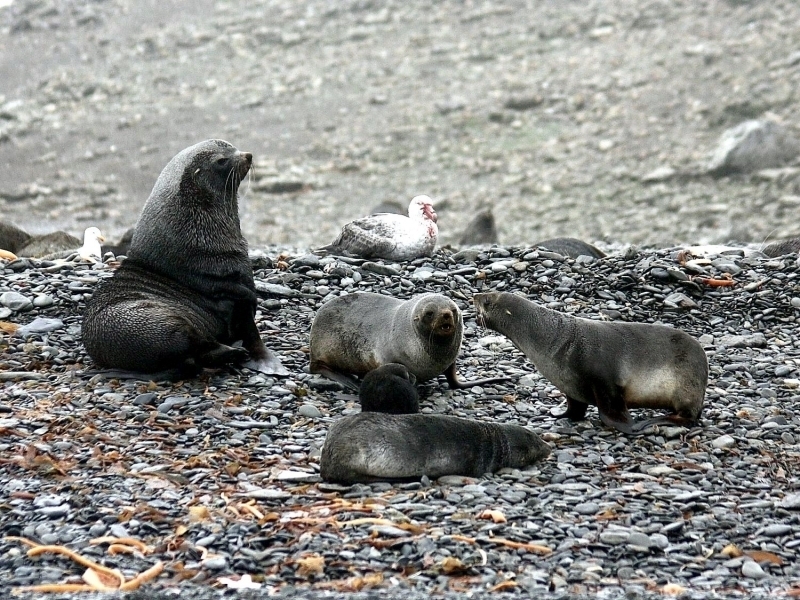 Pups are born about 3 days after the mother’s arrival at the rookery. 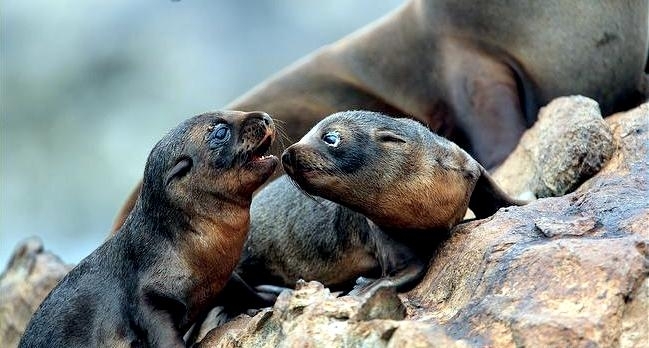 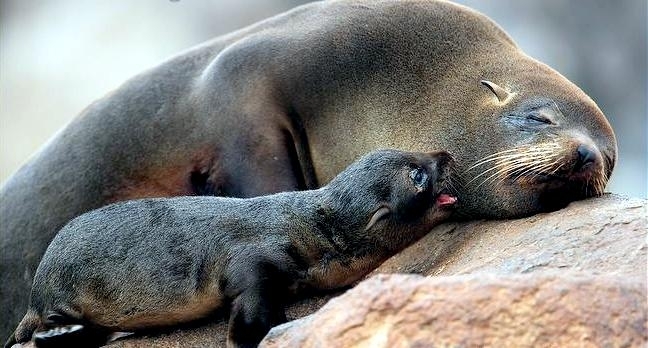 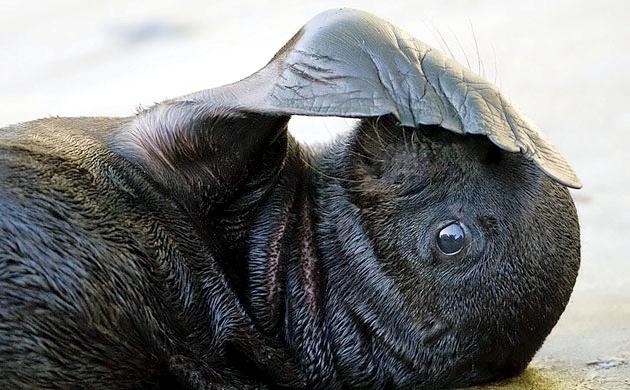 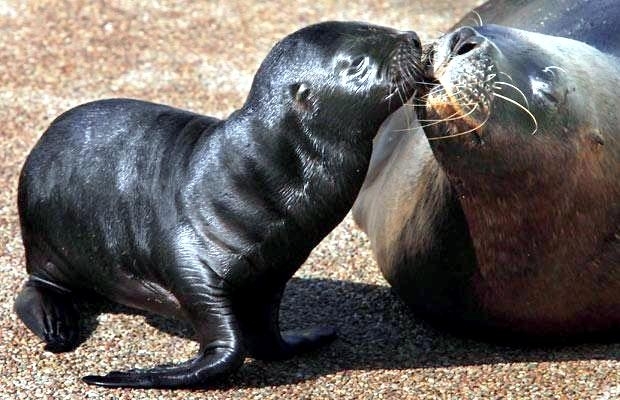 Male Southern Sea Lion pups are born weighing an average of 13.7 kilograms and measuring 82 centimeters in length, females are smaller, weighing an average of 12.3 kilograms and measuring 79 centimeters. 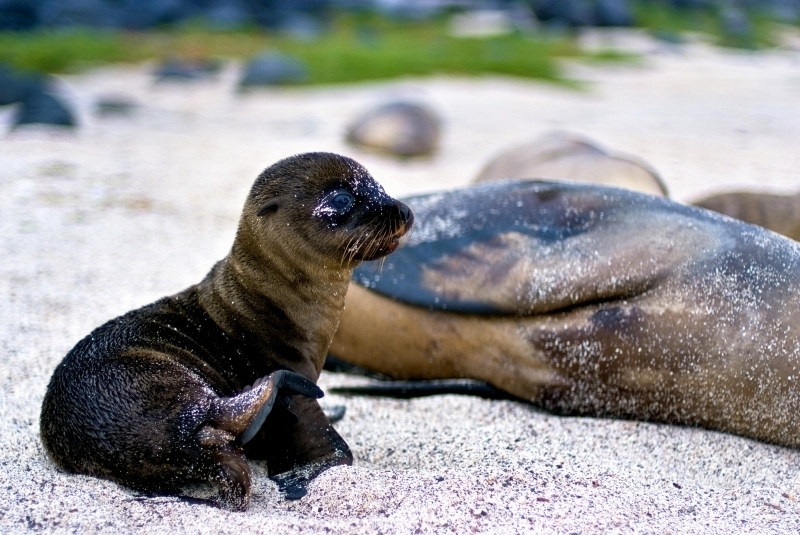 Newborn pups have a black coat that will eventually turn brown to reddish-brown after a few months. 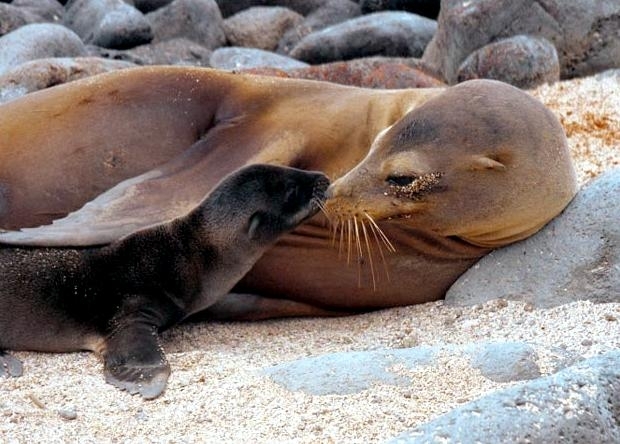 The mother usually mates about 7 days after giving birth, and then begins the feeding cycle leaving her pup to feed at sea for 3 days then returning to nurse for 2 days. 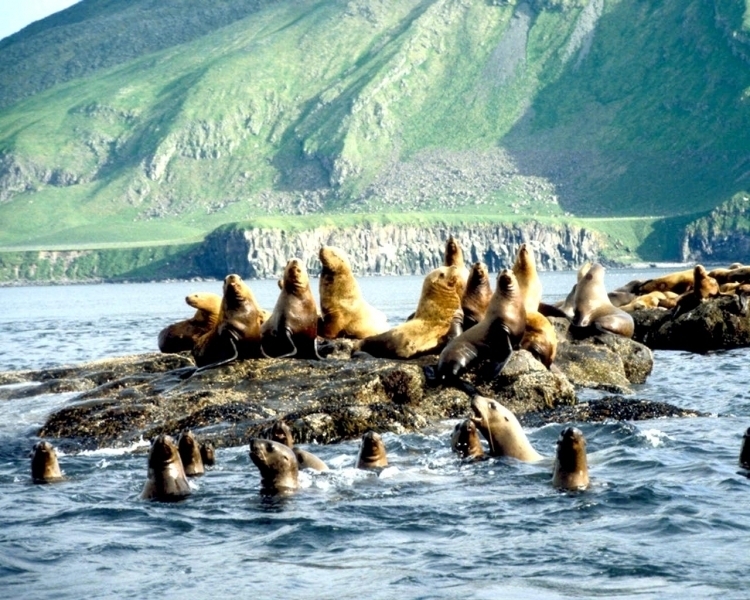 This cycle lasts for about 6-12 months. 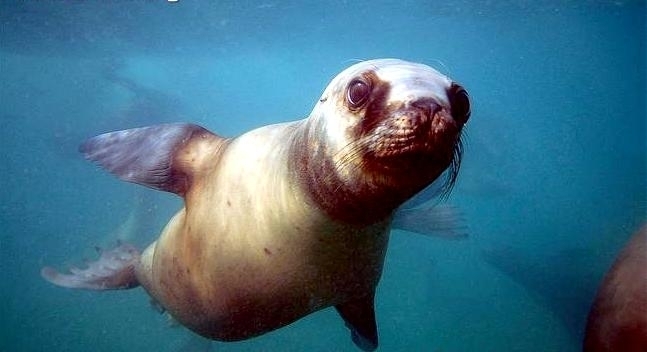 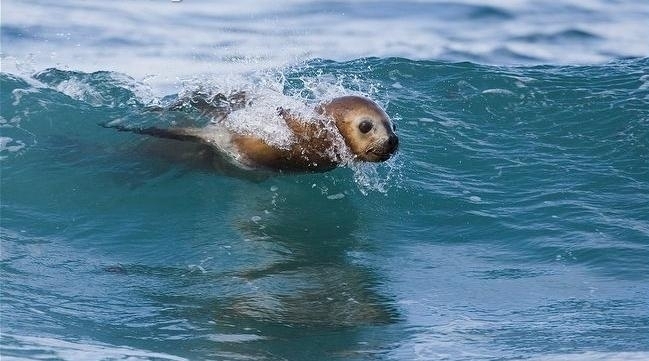 Southern Sea Lion pups begin swimming at about 3-4 weeks of age and are good swimmers by the time they are 2 months old. 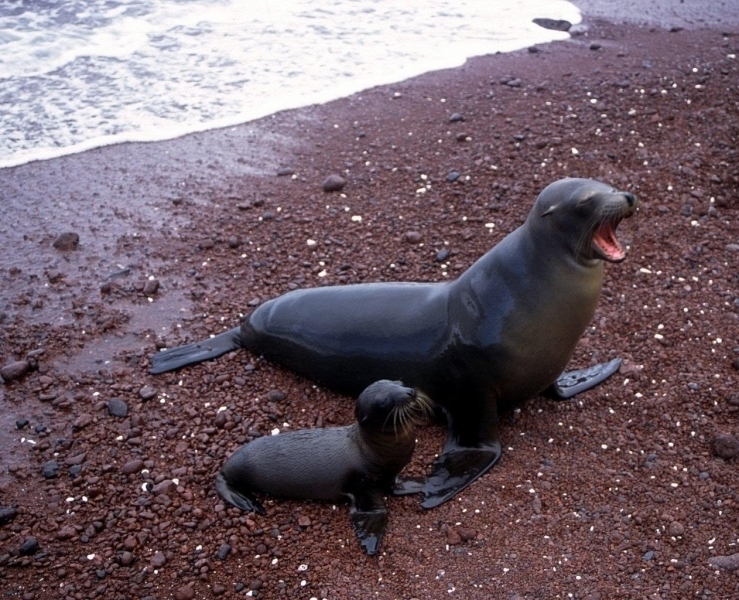 After breeding season, males disperse wandering long distances as far as the South Pacific Islands and as far north as Salvador, Bahia in northern Brazil.